Protest in Budapest, Hungary on December 16, 2018. Photo by Atlatszo.hu/Márk Tremmel, CC BY-NC-SA 2.5. This article is based on the story “Protest and standoff continue at the public service media HQ – Opposition MPs removed from the building by force”  written by Anita Kőműves and Babett Oroszi, with photos by Márk Tremmel, Áron Halász and Szebáld Szakál for Atlatszo.hu, Hungary’s first investigative journalism non-profit. It is republished here in edited form through a partnership with Global Voices. Protests in Budapest against Viktor Orbán's right-wing government continued on Sunday and Monday, with protesters gathering in front of the public service media’s headquarters. 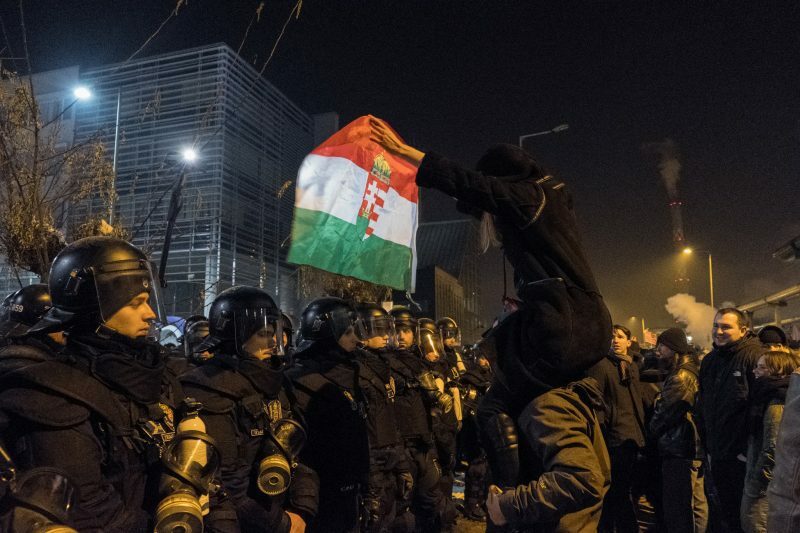 The protests started last Wednesday  in reaction to the so-called “slavery law” which would raise the cap on annual overtime that employers can request from their workers to 400 hours, and another law which makes it easier to place judges that are favorable to Orbán's government in seats of judicial power. 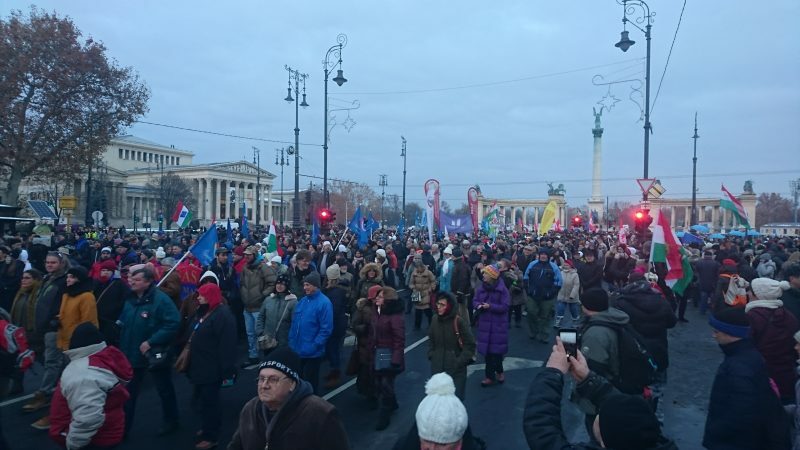 5-10,000 people demonstrated on Sunday against the Orbán government, and the demonstration ended with a few thousand protesters walking to the MTVA (Hungarian public service channel) headquarters. Several opposition Members of Parliament (MPs) entered the building, trying to get air time to read their demands. They were denied this request and stayed until the morning hours when MP's Ákos Hadházy and Bernadett Szél were forcibly removed from the building by armed security guards. Later protesters decided to walk to the MTVA headquarters in northwest Budapest. Protesters reached the building shortly before 9 pm where six rows of riot police surrounded the entrance to the building, preventing demonstrators from entering. Start of December 16, 2018, protest in Budapest, Hungary. Photo from the album from the first night of protests, by Atlatszo.hu/Áronl Halász, CC BY-NC-SA 2.5. Click on image for full album. Opposition MPs Ákos Hadházy, Bernadett Szél, Ágnes Kunhalmi, and Ágnes Vadai entered the building. Unlike ordinary citizens, members of Parliament are free to inspect any public building. Independent and unbiased public service media. MPs were ultimately unsuccessful in their attempt. Meanwhile, outside the MTVA building, protesters tried to push their way through the riot police who began using tear gas to disperse the crowd. MPs inside the building were live streaming the events as they happened. Bernadett Szél’s live stream broadcasted early in the morning when Ákos Hadházy was tackled by security guards as he tried to enter a studio to read their demands. Later Hadházy and Szél were both forcibly removed from the building, with thousands following the events live on Facebook. The standoff between MPs and MTVA security and management continues. MPs want police to help them practice their right to inspect public buildings. At the same time, MTVA wants police to help them enforce a decree by the local clerk that orders the MPs to leave the premises. 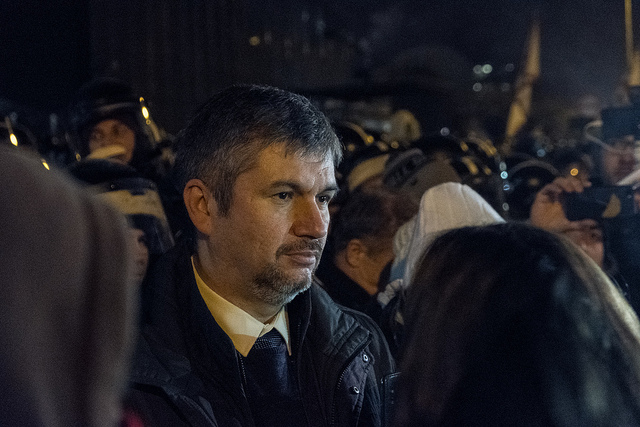 Akos Hadházy, MP in front of the MTVA HQ in Budapest on December 16, 2018. Photo: Átlátszó.hu/Mark Tremmel, CC BY-NC-SA 2.5. “It is very hard to describe my feelings, such an event is very humiliating and disturbing. I did not expect this, I was expecting some degree of restraint from those in power but that did not happen,” he said. Hadházy said that the events prove two things for him. First, that it is a good choice to protest at the public service TV, as that is ’one of the most important bastions’ of the government’s power. Hadházy thinks that what happened to him also proves that the government is scared. Hadházy said that he is very grateful to the protesters who made the long walk Sunday night to the MTVA headquarters. He added that he will definitely attend the Monday night protest, scheduled to start at 6 pm. The protests continued on Monday and again ended up in front of the MTVA building. Opposition MPs attempted to enter the state TV headquarters but were subject to violent reactions by the security detail. After a 10-hour standoff in which editors refused to give the legislators airtime, security guards forcibly ejected four MPs from the MTVA . The assault by security guards and the consequent scuffle left several MPs injured. One of them was Laszlo Varju, who was eventually taken to a hospital in an ambulance. At least 4 opposition MPs were assaulted today in #Hungary , one of whom was hospitalized. That's today's key takeaway. The #Orban  regime has crossed a threshold that it previously dared not cross. How will his main international enablers — @ManfredWeber  @usembbudapest  — respond? The Hungarian government lead by Victor Orban has so far shrugged off the protests  and shows no sign that it will discontinue with its radical right-wing agenda, which reshapes both the Hungarian society and influences the European Union and the neighboring regions .